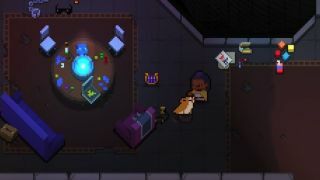 There’s a dog in bullet-hell roguelike Enter the Gungeon, and it follows you around, finds items, and barks at mimic chests. Even though it is a very good boy (or girl), you couldn’t pet it to show how thankful you were for its undying loyalty. But that has recently changed: Enter the Gungeon’s dog is now pettable, and it’s all thanks to a certain Twitter account. Early last month, when the account had just gotten going, Can You Pet the Dog highlighted Enter the Gungeon, noting sadly, “You cannot pet the dog in Enter the Gungeon.” New Blood Interactive CEO Dave Oshry noticed the tweet, responding with a weeping emoticon and tagging Dave Crooks, the designer behind Enter the Gungeon. “Hold my beer,” Crooks replied. Fast forward to this past Friday when Dodge Roll Games released its final update for Gungeon, titled A Farewell to Arms. It adds a bunch of wacky new weapons and items, new secret floors and bosses, and new characters. And you can now pet the dog. For its part as a dutiful archivist of pettable video game dogs, Can You Pet the Dog deleted its original Enter the Gungeon tweet and posted an update.